Ultimately, this is a team book, but the way Marc Sumerak writes many of the central characters seems just a little bit off – Wolverine cracks a bad joke, Spider-Man opts for a ride in a limousine, and the Hulk has no problem with slowing his rage when the battle ends. They’re little things, but they were enough to momentarily take me out of the story and sometimes that makes all the difference. Fortunately, those characters’ inclusion in this issue were little more than guest spots, since the real story is focused on Hank Pym’s disappearance from his lab and Giant Girl’s search for his immediate whereabouts. Sumerak’s story is pretty bare bones, but he somehow manages to make it work. As the focal point of this story, Giant Girl gets a lot of time to define herself as a character and stand out from the pack, which is an opportunity the writer doesn’t waste. He grants her a great series of personality quirks, and ultimately the process makes her a much more identifiable, appealing character. By the end of the issue, I was pulling for her to win the big fight, where before I didn’t have a lot of time for her, so Sumerak must have done something right along the way. His work has a lot of holes, such as his knack for writing awful dialog, but he’s covered those up here about as well as can be expected. Ig Guara’s artwork, on the other hand, was nearly a constant highlight… which was a real surprise considering the quality of work I’ve come to expect from the Marvel Adventures line. His art has a lot of depth and personality, and while he doesn’t seem to be completely at ease with the all-star cast of the Avengers, his take on Giant Girl is terrific, ditto for Hank Pym, and he really excels when he’s illustrating normal civilians. For an issue that’s largely focused on… well, Giant Girl, Hank Pym and an array of normal civilians… that’s pretty important. His best work is late in the issue, when the story climaxes in a giant-sized throw down in downtown New York. His storytelling during that action scene is top notch, and more than makes up for the cheesy dialog it accompanies. When Giant Girl hits the floor, knocking cars into the air and snapping trees as though they were twigs, it’s great stuff. Guara seems to have a gift for moments like that, and he made a fan out of me with this issue. 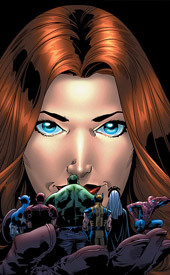 The thing that struck me the most about Marvel Adventures Avengers is how it’s treated with a lot more respect than the other titles in the youth-oriented line. While Marc Sumerak’s writing frequently bordered on the smiley-happy, it never felt like it was talking down to the audience. He didn’t tread on any iffy subject matter, but he also didn’t pull any punches – this was a simple story, but it had just enough substance to make it worthwhile. It’s just about a perfect fit for the format of a single, self-contained story outside of the mainstream continuity. Borrow this from a friend, admire the artwork, snicker at some of the dialog and enjoy the ride. It’s a fun little story.